Recent deregulation of laws on hospital real estate in the Netherlands implies that healthcare institutions have more opportunities to make independent accommodation choices, but at the same time have themselves become responsible for the risks associated with the investment. In addition, accommodation costs have become an integral part of the costs of healthcare. This sheds new light on the alignment between the organisation of healthcare and accommodation: care institutions themselves bear the risk of recouping their investment in real estate and high accommodation costs lead to higher rates for healthcare compared to competing institutions. of accommodation decision by using recent cases in Dutch hospitals. CREM can be defined as the management of the real estate portfolio of a corporation by aligning the portfolio and services with the needs of the core business in order to obtain maximum added value for the business and an optimal contribution to the overall performance of the organisation. This definition assumes that accommodation can add value to the organisation and contribute to its overall achievement. Elaborating on the added value of real estate in addition to quantifying these added values and making them applicable to hospital real estate management is therefore central to this study. The added values determine the transition between the different phases in the cycle of the initiation, design, construction and occupancy of the accommodation. In addition, the added value of real estate functions as a common language between the disciplines involved in the design and construction of hospital accommodation, such as the healthcare institution, healthcare manager, real estate manager and architect. different disciplines are aligned in order to achieve an integral approach by both organisation and accommodation management. In addition to the conclusions and recommendations of the separate studies (1-4), the final result is a toolbox (PART 5) that can be used to support a decision-making process that results in a better informed real estate strategy. The instruments are tested by an assessment of recently completed hospital construction projects. The context in which hospitals have to make long-term decisions on their investment in accommodation is determined by political, demographic, economic, social and technological factors. Hospitals need to determine their position in relation to these environmental factors on the one hand and the interests of their internal and external stakeholders on the other. Context-mapping (Figure 2) is an instrument to analyse these stakeholder interests, the factors relating to the external environment and sector-specific trends and scenarios. the region. In addition, the influence of various external stakeholders has changed. the organisation and; possibilities for anticipating changes in the organisation of healthcare. the quality of the organisational processes. The basic conceptual model for this is an abstraction of the European Foundation for Quality Management (EFQM) model in four steps: (1) stakeholders’ objectives, (2) the organisation’s key issues for success, (3) managing the organisation’s structure and resources; (4) improvement of the primary process. The plan-do-check-act cycle as common ground in quality management is also included in this basic conceptual model. (D) the primary process (4), and the design of the building (8). In the integrating framework, the steps at the level of the organisation are completed by the steps of the EFQM model. The strategic, financial, functional and physical perspectives on real estate (5) can be positioned parallel to the stakeholders’ objectives (1) that are described in the EFQM-INK model. In this way stakeholder management is part of the organisational management and is translated into real estate perspectives on CREM. The perspectives on real estate are translated into real estate added values (6) as the common language that in all phases of the real estate lifecycle can be assessed. This concept of adding value by real estate is connected to the key issues for success (2) that result from the demands and wishes of society, employees, customers and the organisation’s management at an organisational level. Both the key issues for success and the added values of real estate provide input into the change management process of the organisation (3) and its real estate (7). The organisation’s change management (3) is directed by leadership and is about policy & management of the resources, including human resources and real estate. In this part of the model, different resources for production have to be balanced against each other. This results in a process that has to be implemented in a physical environment. In this model, the Designing an Accommodation strategy (DAS)-Frame is the basis for real estate change management (7). In an iterative process a match is made between demand and supply, now and in the future, resulting in a building which can support organisational primary processes. Paralleling the management of accommodation with organisational change thus leads logically to a step-by-step plan for the transformation of the accommodation. Both the processes and the building are compared with the stakeholder demands and related perspectives on real estate. its accommodation decisions. This triple assessment of the organisation and accommodation shows where the organisation stands, how real estate is controlled and the pursued level of ambition with a corresponding focus on product, process, system, chain or society. Value is defined in this study as the valued performance of a product or service that contributes to the achievement of the goals set by the stakeholders. As a consequence, value depends on the (subjective) assessment of the stakeholders. Added values of real estate have to be defined in advance (ex-ante) to pre-set the goals of the stakeholders in order to be able to test them afterwards (ex-post) in the design. as the promotion of organisational culture and patient and employee satisfaction. This cluster is followed by the more tactically oriented production-values such as improving productivity, reducing accommodation costs and the flexibility to adapt the physical environment to new healthcare processes. The third cluster consists of future- values, e.g. the image of the building, sustainability, real estate related risks and the opportunities to use the financial value of real estate for financing primary processes. added values of real estate and stakeholders different perspectives of real estate. This instrument makes it possible to highlight the added values of real estate from different perspectives on real estate (strategic, financial, functional and physical). Table 4 shows an example of possible connections between one of the values – patient satisfaction and healing environment – to four different perspectives. 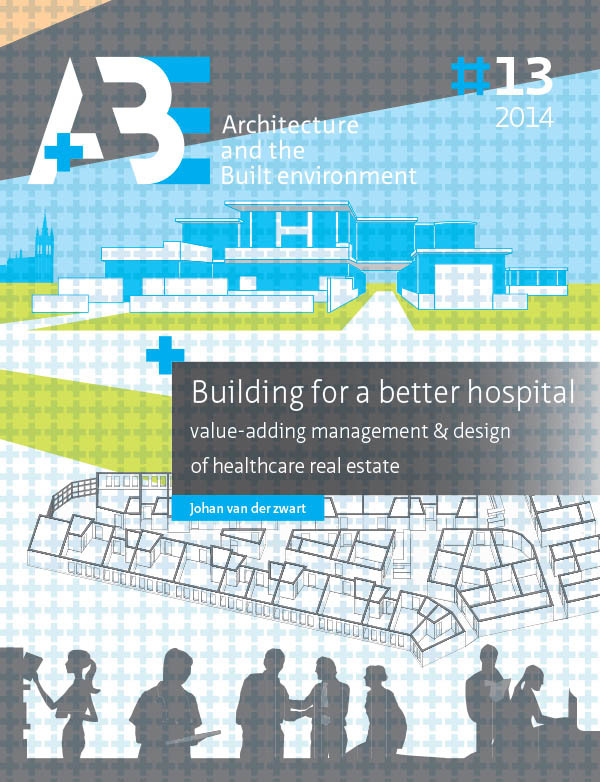 built environment of hospitals. This is possible by comparing the results of design assessment with measures of user experiences in actual buildings, e.g. by building-in- use studies or so-called Post-Occupancy Evaluations (POE). also be combined. As such, the toolbox provides guidelines for the distribution of responsibilities and tasks between the hospital board, real estate manager, healthcare managers and architects in various phases of occupancy, initiative and design. The case studies demonstrate the usefulness of the conceptual models of CREM in matching accommodation for hospitals and the organisation of healthcare. The model for context-mapping provides a starting point for getting a grip on the position of real estate in the dynamic context of hospitals. The arrangement of different conceptual models in the meta-model and the link to the EFQM model as an abstract description of the organisation results in a roadmap in which the accommodation and organisation of healthcare can be coordinated iteratively. While the meta-model at the level of the CEO provides an overview and outline of the considerations to be made, the integrating framework is a comprehensive tool for real estate managers to further elaborate on these various steps. Generic values from the literature are discussed and translated into the sector-specific added value of hospital real estate. In addition, design assessment makes it possible to test various aspects of pre-set values already before the design is actually constructed. real estate managers, healthcare managers, medical specialists and the hospital board can contribute to a better balance between accommodation and healthcare. On a conceptual level common principles from real estate management and the organisation of healthcare are aligned in the meta-model in four steps (context, value, manage, design). On a practical level the added values of real estate are to be regarded as a common language between the different disciplines. the organisation and its processes. In addition, existing models from the CREM literature are positioned relative to each other by using two basic principles of quality management and in this way implicitly looking at the quality of the accommodation parallel to the organisation and its primary processes. How the added value of real estate can be connected to spatial quality is then examined. The classification of added value in user-value, production-value and future-value turns out to be a useful clustering. This opens a window to considering the added value of real estate as the realisation of quality, as perceived by the stakeholders. With this in mind, consciously managing and integrating the added values of real estate with a focus on the quality of the organisation, accommodation and spatial design can be seen as the answer to the main research question of this thesis. hospital board as central stakeholder is responsible for balancing the interests of the different stakeholders; the establishment of accommodation goals; the alignment of accommodation goals to the organisation’s mission and vision; and the assessment of whether all these goals are achieved in the design of the hospital building. An integrated development of organisational management and real estate management is recommended in order to align accommodation management to the vision, mission and goals of the hospital organisation. Managing hospital accommodation requires a balanced analysis of the potential added value of real estate. Important values include: user-values such as improving the organisational culture and satisfaction of patients and employees; production-values such as reducing accommodation costs and increasing productivity and use-flexibility; future-values such as reducing real estate risks and increasing financial possibilities, supporting the image of the organisation and sustainability. Managing hospital accommodation requires careful consideration of the interests, preferences and requirements of all stakeholders and perspectives on strategic choices, financial considerations, user perspective and the physical possibilities of real estate. Achieving added value from real estate requires the ex-ante formulation of accommodation targets and ex-post assessment of whether these objectives have been met. This assessment of accommodation goals in an architectural design demands pre-construction design research by floor plan analysis in which the values are made visible and measurable and as such part of the design decision process.